How is my FICO® Credit Score calculated? Your FICO® Credit Score considers five categories of credit data from the three credit reports. 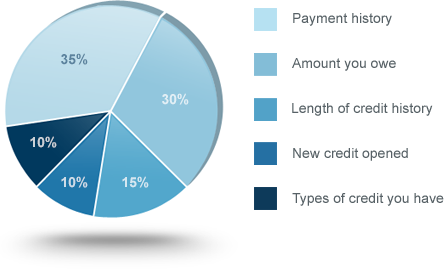 The percentages below are based on the five categories for the general population. If you have had a foreclosure or loan modification where you did not pay your mortgage for an extended period of time, once you start paying again and keep your payments current for at least 12 months, you can once again apply for a mortgage and buy a home. There are a variety of new loan programs available for people with poor credit.